As I told you in the post about our cocoa tablet from raw cocoa beans, we brewed two different Porter style beers using that tablet. In this first post I’m going to describe the first of them, which we named Chocolatastic Porter. First I will describe what was our idea, then the ingredients we chose and, finally, the process we followed. While designing this beer our idea was to get a Porter that would remind us drinking chocoloate, but in beer form. For this, we first needed to get a cocoa flavour as intense as possible. We would like also to add some adjuncts that go well with chocolate (cinnamon, vanilla) and keep some residual sweetness. As cocoa is bitter, we should restrict bittering hop additions. Regarding yeast, as we wanted cocoa to shine, we would need a clean yeast to ferment the wort. Evidently, the first ingredient was obvious, the cocoa tablet we had previously made. We needed to choose the amount to add. 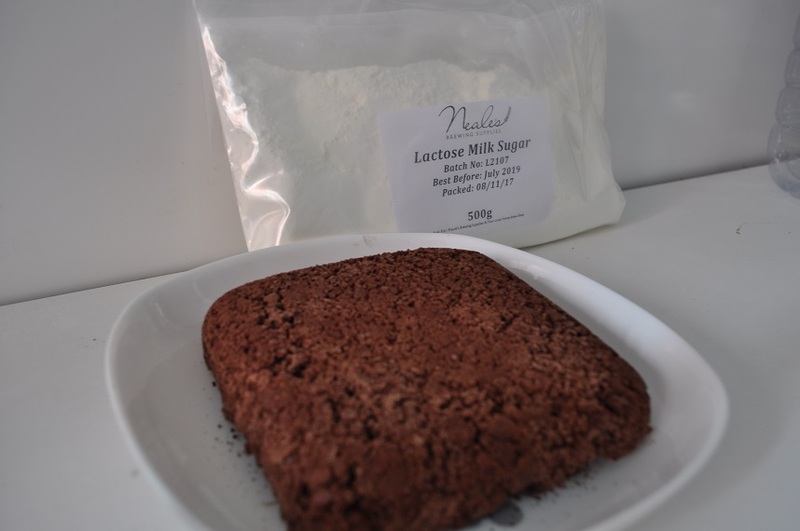 For that, we did a little research reading articles about brewing with cocoa and chocolate, finding some real nice ones like this from Cat Stewart, or this one from Chris Colby (sorry, this one only for Brew Your Own subscribers). 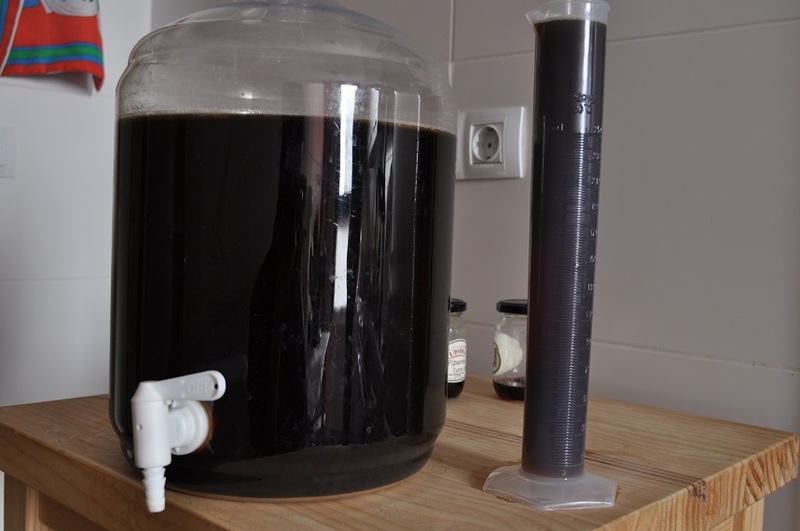 Considering all these articles, we decided to add about 100 g (3.5 oz) from the cocoa tablet for 10.5 liters (2.77 gallons) of beer. Following Chris Colby’s advice, we also decided to add lactose to get that residual sweetness we were looking for, 150 g (5.3 oz) the last 15 minutes of the boil. As for the malts, due to stock issues we picked two different base malts, Pilsen malt and Maris Otter, coupled with various special malts usually used for Porter beers. Some biscuit malt to get some complexity, chocolate malt for obvious reasons (colour and flavour) and flaked barley to get some body and help with foam since we were afraid fats from cocoa could detriment foam stability. Regarding hops, we finished the amount we had of Chinook using it for bittering and we used some Northern Brewer for a flavour addition at 15 minutes before finishing the boil, choosing this variety because we thought it could go well with this style due to its earthy and woody atributes. To get a clean fermentation we trusted the always reliable US-05 from Safale. Finally, we also used a cinnamon stick and two vanilla beans, soaked for some days in the minimum volume of vodka to cover them. We added this vodka at bottling. For the water we used for brewing, we only added some calcium chloride to get a mash pH of 5.5 and additionally to boost calcium and chloride to help with yeast growing and to increase malt flavour, respectively. You can see the final recipe and a summary of the process for this brew below. In the morning of the brewday we boiled water to remove chlorine and we left it cooling until the afternoon, when we adjust the water profile adding calcium chloride as I previously mentioned. We mashed with 12 litres (3.17 gallons) of water and the crushed grain, stirring well before putting the lid on. Initial mash temperature was 67ºC (152.6ºF). After half an hour we open to stir the mash again and temperature had decreased to 65ºC (149ºF). After one hour the temperature had dropped to 63ºC (145.4ºF). While we stirred the mash one more time, we added 7.7 litres (2.03 gallons) of almost boiling water for the mash out, keeping a temperature of 75ºC (167ºF) for 5-10 minutes before we removed the bag with the grains. Pre-boil gravity was 1.041, a little bit higher than the theoretical one (1,036), probably due to a finer crush. We made the hop additions showed in recipe above during the boil, and just after the last one, we added cocoa and lactose, stirring well to add dissolving both. After 75 minutes of boil, we started to cool the wort with our cooper immersion chiller. 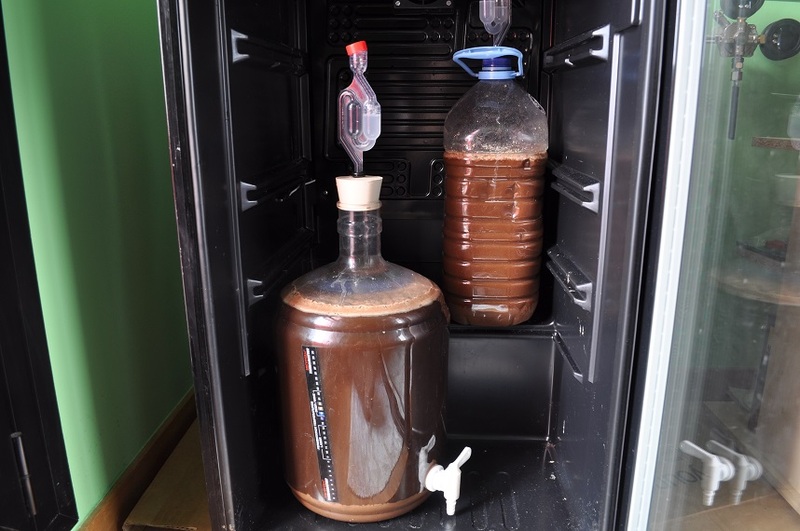 When the wort reached 19ºC (66.2ºF) we transferred it to a demijohn that we left in the fermentation chamber, set at 17.5ºC (63.5ºF), while we rehydrated the yeast. Maybe we should have boiled more vigorously because we ended with 1.5 litres (0.4 gallons) more than planned. That left us with a wort with an original gravity of 1.050, being the theoretical value 1.057. Not too much of a difference, but we have to keep on working to fine tune our equipment. Twelve hours after pitching yeast, fermentation was vigorous, with a good krausen formed. Cocoa aroma was evident, with a hazy appearance typical of active fermentations. Beer temperature was 18.5ºC (65.3ºF), with the fridge still set at 17.5ºC (63.5ºF). 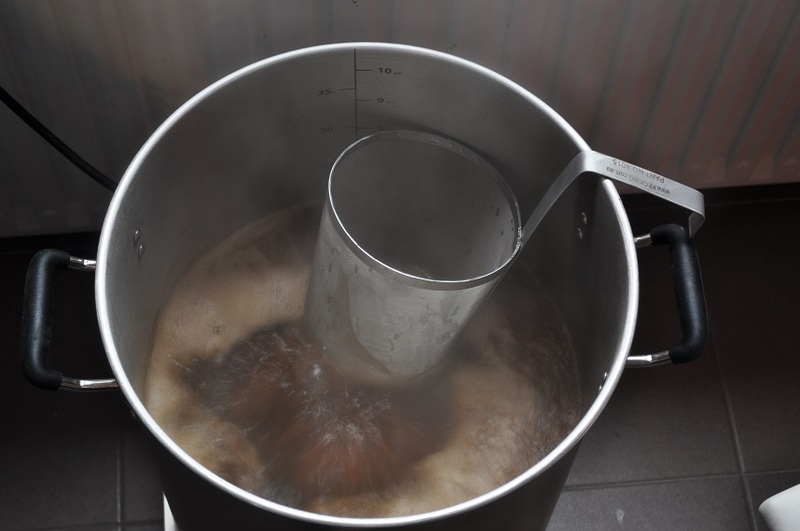 On the second day, krausen was even thicker and beer temperature was higher, 19.5ºC (67.1ºF). On the third day, fermentation signs started to disappear, the krausen was gone and beer temperature dropped to 18ºC (64.4ºF). We left it that way for a few days and, after two weeks from brewday, we transferred the beer to another demijohn to left some trub behind. We took a sample to taste it and it was quite good, with a pronounced bitterness and a more than evident cocoa flavour. One week later we found some time to bottle. 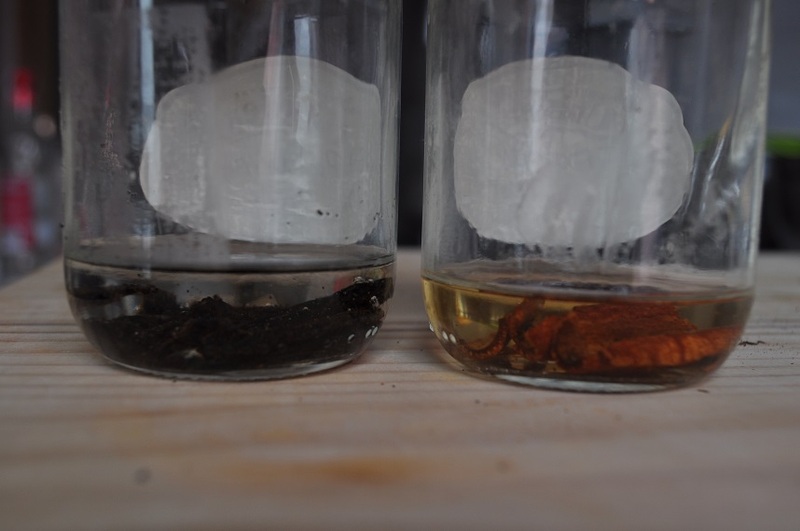 At this point, apart from adding sugar for carbonation in the bottles (enough sugar for 2.2 volumes of CO2), we added the vodka in which we had soaked the cinnamon stick and the vanilla beans. As you can see in picture above, the amount of vodka must be the minimum to cover whatever you want to use, so its effect is negligible in the final beer. We have tried this method of soaking in vodka several times with different ingredients and I think the result you get from it is pretty good. In this occasion, we kept the cinnamon stick and the vanilla beans in vodka for a whole week, and judging from the colour and aroma of the vodka it was more than enough. We bottled 27 bottles of 33 cL (12 oz), with a final gravity of 1.013 and an ABV of 4.9%. This FG was higher than normal due to the lactose we added, since this sugar cannot be fermented by the yeast we pitched. In future posts we will tell you the process for the other beer we brewed with the cocoa tablet (a Porter with tangerine juice) and the result for these two beers. This entry was posted in Elaboration and tagged cocoa, Porter. Bookmark the permalink.